Leaving an organization is an overwhelming time for any employee and exit interviews tend to make that moment even more excruciating and annoying. Most employers and HR personnel conducting the exit interviews are usually bothered by the employee’s departure for a new job (are they joining a competitor? What is their role there?) instead of focusing on why the employee left this job in the first place. At some places, an exit interview is merely a formality and does not hold much value even though these interviews could be eye-openers to problems the employee may have faced in the workplace. Yet at some other places, human resource professionals will choose to use exit interviews to try to convince the employee not to leave. In either case, the exit interview is used for the wrong purpose and creates an awkward moment for the employee. An exit interview can be conducted by either the HR personnel, or the immediate supervisor and manager. Although it is the domain of HR, managers and supervisors are being encouraged to perform these interviews and gain additional insight on the challenges and problems employees face within teams and departments. This may be challenging for the supervisor or manager who has not been trained to listen to the employee’s concerns and may result in unnecessary emotional conflict. In order to carry out an effective, transparent, and healthy exit interview, supervisors need to be trained and provided with materials to enable them to do the task right. Every exit interview should ideally be on record and the employee’s feedback, experience, concerns, and suggestions should be used as a means to improve company processes. During an exit interview, it is necessary to listen attentively to the employee and ask questions rather than argue. The interviewer should not make assumptions and should not be vague. By the same token, they should also not be aggressive or manipulative using the exit interview as a chance to intimidate the employee. Keep the session informative and positive, wishing your employee luck in their new role. 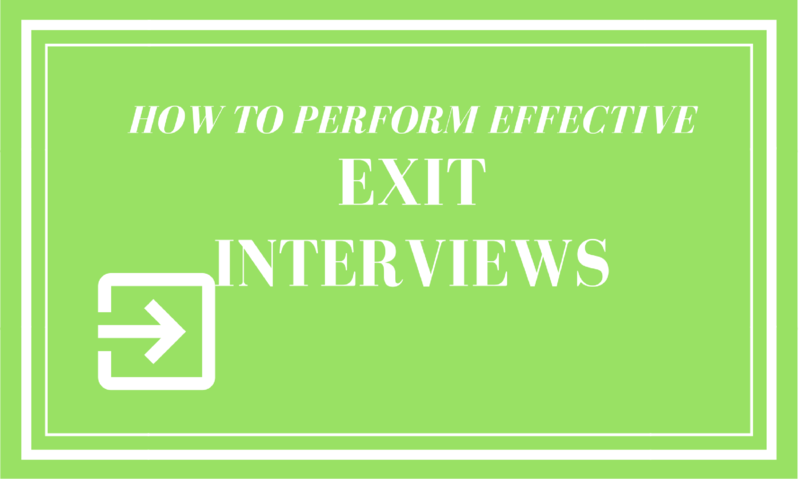 Here are a few additional important tips to perform effective exit interviews. Don’t make the mistake of merely calling the employee on his last day and drilling him with generic, robotic questions. Study the employee’s profile, evaluate their strengths and weaknesses, know where they are going to and what they are doing next. Study their file, identify if there has been any past situation or grievance that was not resolved. Understand the motive for leaving. All this is not to stop the employee from leaving, but rather to reflect on the shortcomings of your own company. Planning, therefore, is an essential part of an exit interview. If you care enough to plan, you care enough for your company’s reputation. Not all resignations are simple ‘for a better career’ moves. Most resignations are the result of unsatisfying work culture, annoying bosses or lackluster job roles. Under these circumstances, the employee is frustrated and perhaps even upset. It is imperative for the interviewer to adopt an understanding tone and be an observer of the situation and take careful notes. You should avoid being defensive, offensive or sarcastic as is often noted when employees are made to sit through an exit interview. Usually, employees prefer not to talk honestly about their time in the organization, fearing it will result in negative feedback affecting their reputation. They are afraid that anything they say may be used against them in the future or the information they give may cause sour relations between managers and co-workers. Confidentiality and professionalism is highly important here. It is the job of the interviewer to encourage the employee to be honest and ensure them that the exit interview data will be presented in an aggregated format. The employee can comfortably speak the truth if they are assured that feedback and suggestions will be used to improve company culture and that it will not in any way affect their reputation. Their insight, evaluation, and feedback will be helpful in improving processes and cultivating a better company culture. The questions you ask here will help you identify weak areas of the company and the advice they give can be used to revise company policies that no longer serve the interest of the company and its employees. An effective exit interview is one where the employee feels confident enough to share concerns without feeling threatened. An exit interview should not be left to the sole discretion of the employee’s immediate supervisor as that could result in an undesirable influence on the employee. A two-tier exit interview process starting from the supervisor, formally followed up by the HR can be an effective way to ensure transparency in communication. The interview should be brief and simple, yet it should also be able to cater to important questions that can identify the cause of the employee leaving the job, what they liked or disliked about a company, any unpleasant event that may have caused them to leave the job and so on. You don’t have to get very personal, but you do need to know if there was anything within the company that sparked the decision for a well-performing employee to leave. Does your current company offer you a more challenging role? Could you talk about it a bit? What improvements do you think we need in terms of culture or processes? What do you value most about this company? If you could go back in time and fix a wrong, what would it be? Do you have any concerns that were not addressed? What are your views about management and leadership, in general, in the company? Did you have clear goals and did it satisfy your job description? Do you have any recommendations regarding our compensation, benefits, and other reward and recognition efforts? Can you provide us with any valuable feedback that may help us improve the company? If your company refuses to acknowledge the power of competing organizations, you may be making a huge mistake. One of the best ways to learn about the potential of the competing organization is through the exit interview. However, this strategy may fail if it is obviously a data mining process. You just need three questions to know where your competitors are in terms of human resource potential - the employee’s job description, their remuneration package range (and if employees are confidential about this then perhaps their bonuses or benefits) and finally new challenges that the leaving employee is aspiring to work on. An exit interview is the last chance you may have to treat the employee with respect and value. Remember, a disgruntled employee has the potential to disrupt a company’s reputation. You may even lose out on valuable talent if you don’t take your employee’s views about the company seriously. Therefore, during an exit interview, it is highly necessary to treat the employee as a customer who will be going out there in the world talking about. Doing the opposite - such as showing resentment or isolation over their leaving will only worsen your company’s reputation. You do not go through an extensive interview process just to have it vanish into thin air. Process the interview strategically, suggesting improvements and change in company processes for the new hire. You do not want your employees to leave over and over for the same reasons. Arrange meetings with concerned managers and discuss the issues discussed by the employee. Ask for opinions, suggestions, and look to take action. Put forth an effort to review the exit interview questionnaire and process the information to ensure you get maximum output from the feedback. An integral part of organizational development, exit interviews should be taken seriously and should be used as a powerful, human tool to identify core issues in a workplace and ways to resolve them. Neglecting the importance of exit interviews is equal to neglecting the responsibility of making your workplace a better working space for current and future employees.